ANTALYA mention of the date first that comes to mind is the sea and nature. A unique installation in the Antalya's historic and natural wealth of the past, the city has become one of the Mediterranean's most beautiful cities. ANTALYA come in and there are many places to go to see it. Domestic and foreign thousands of tourists that flock to Antalya, although known for its marine tourism, will host the sports and business tourism in the winter. During the winter months as it comes to a lot of individual and team sports and clubs ANTALYA. Large companies are conferences and meetings are held in the hotel. ANTALYA Airport and bus station, is forced to entertain visiting this province. The number of visitors is increasing every year, the tourism industry is having to adapt to this increase. The priority issues are transportation and accommodation. Rail transportation facilities without Antalya, sea transport is only available to transport large cruise ships or private yachts. This leads to the intensity experienced in the air and land transportation. Although Antalya airport, although large and modern, does not meet the needs of the summer. All this in addition to public transportation, car rental companies serving in ANTALYA also form a ring of the transport chain. 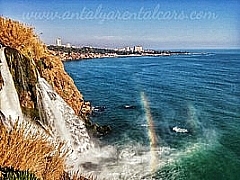 ANTALYA car rental companies generally and also scattered in the different points of service and trailers in the city, there are many in and around Antalya Airport. There is no bus station in Antalya is a car rental company. As before, the car rental companies are so-called door customer rather than the customer is directed to the more corporate employees and which car rental companies on the internet. we as a car rental company in ANTALYA, located on the main page booking form we offer car rental services. Before making a car rental company or the company's absolute seriousness, you need to check whether familiar or not reliable. Car rental is a real risk that some bring along. To avoid problems during journeys you make, you have rented vehicle must check before delivery. Located in "ANTALYA car rental" economical diesel and gasoline in our car, you can rent suitable vehicle for every budget. Mail or phone reservations can be, we deliver your car to the address you specify. In long-distance and ANTALYA delivery vehicles drop off fee is applied. Automatically and seamlessly with our new model cars, a safe and comfortable ride awaits you.